Andy made crepes for breakfast and I loaded them up with strawberries and blueberries. Yum. Spence stopped in for a cup of coffee, but didn’t stay to chat. He was anxious to get started weed whacking, or string trimming if you want the official government terminology. I was running a load of laundry and we were sitting at our computers when I saw small motorhome coming down the drive to our site. “Wait! It’s Joe and Linda! !” I jumped up and ran out the door while Andy was trying to make sense of it. 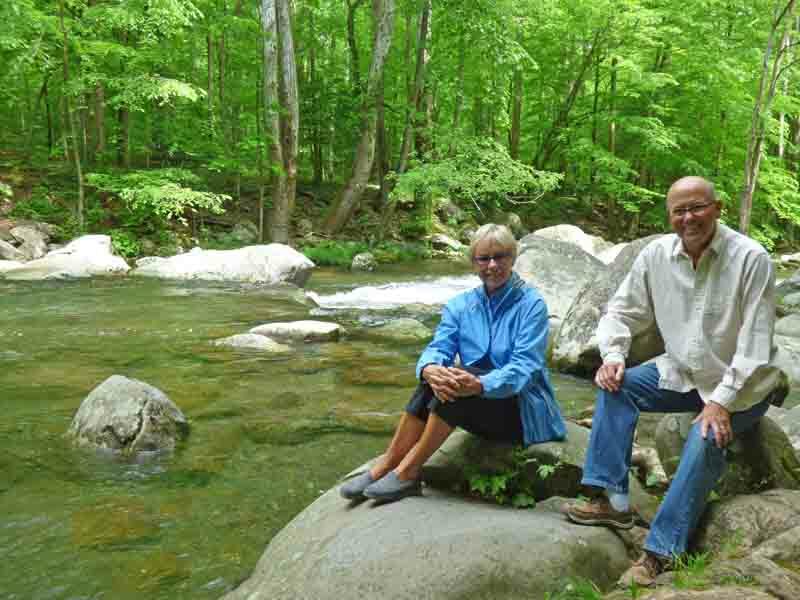 Joe and Linda Coffey were in Key RV winter before last. She reads my log and sent an email a few weeks back saying they might stop in on their way to Michigan. Frankly, I had forgotten about it. Linda was worried that we would not be here because she could not contact us by phone or email to let us know they were coming. In the past, Monday was our day to go to town to shop, but Boss Larry had said he was coming over to see us at 10:00 so we stayed home. 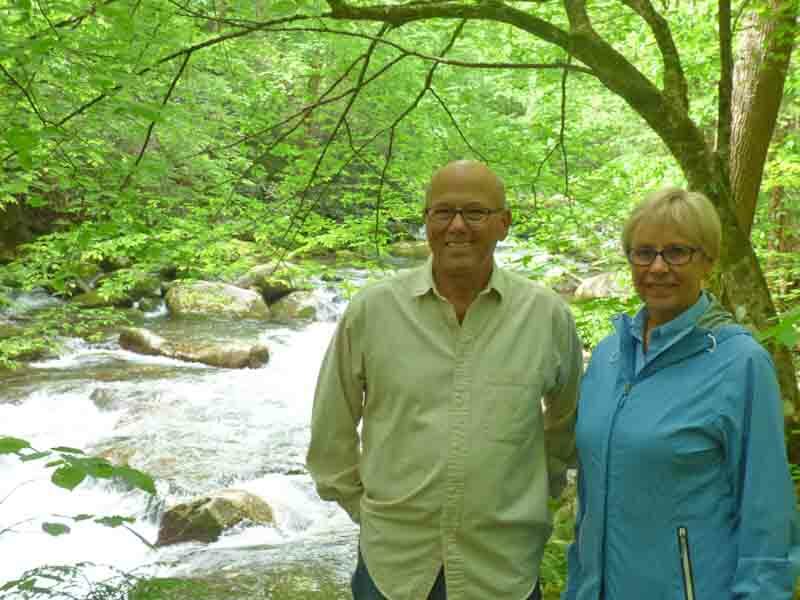 Linda said they didn’t remember the campground name correctly and went to Deep Creek campground on the south side of the park near Bryson City. The folks there never heard of us. Joe and Linda checked into a motel with internet access and read my blog to find the correct name for our campground, and then drove here this morning. They drove up to the campground first and saw Spence. She asked him where to find us and he responded that he didn’t know us, but Linda recognized him from the blog and knew he was joking. I was just as surprised as Andy was to see them drive in. Neither of us were surprised that Spence was joking. We walked around and showed them the campground (Andy did the morning campground check) and followed the path along the creek. Andy met us at the bridge. 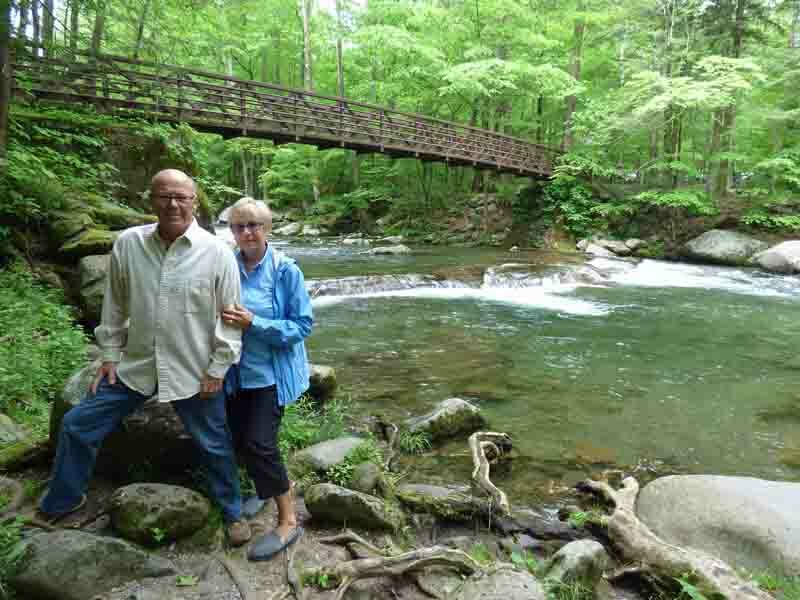 OK, I took a lot of pictures of Joe and Linda at the creek. They are just the cutest and most photogenic couple. Spence was working along the fence near the toilet building when we walked by to the host site. He yelled at me that I never take his picture when he is working so I turned around and aimed the camera. He struck a pose but, it doesn’t look like he is working. Boss Larry had not shown up by lunch time and Joe and Linda needed to sample Mellow Mushroom pizza. I called Larry on the radio to let him know we were going out. He did come over and drop off some supplies for us while we were out to lunch. I hate to miss him, but Joe and Linda bought the pizza! 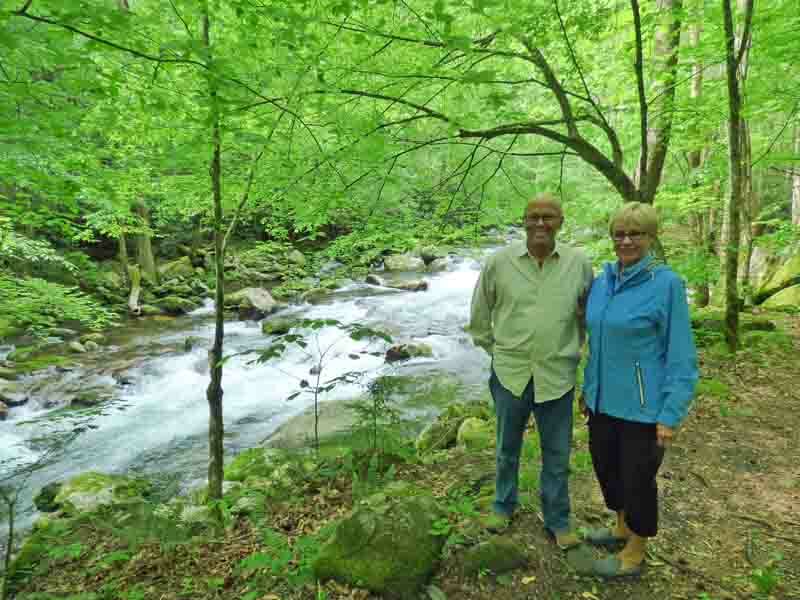 On the radio: There was an automobile crash in the spur from Pigeon Forge into the park. The reporting party said that the car had passed them at a high rate of speed. They were calling for a tow truck and extricating equipment. The driver needed to be air-lifted to UT in Knoxville. We hear this sort of accident periodically on the radio but, what struck me this evening was that they were struggling to find available rangers to assist.